If you’ve been keeping tabs on Fox’s upcoming TV schedule at all, you may know that Prison Break is coming back in the form of an event series, with most of the major players returning. Fans of Prison Break probably find this concept to be a little bizarre, as Wentworth Miller’s character Michael bit the dust at the end of the series. But Fox is already ready for the naysayers and has gone ahead and addressed the solution in the brand new trailer for Prison Break. Check it out. He was like a storm. Appearing suddenly out of a clear blue sky and then would disappear just as quickly. The young man unexpectedly says that storms can come back, conveniently leading into a trailer that’s all about how Prison Break will bring Michael Scofield back. Fans of Prison Break will remember the series ended with Michael sacrificing himself to save the woman who was carrying his then unborn child. A follow-up TV movie seemingly confirmed the fact, but Fox has now full-on retconned what happened to suit the brand new TV series. In the trailer, we learn that Michael’s family still holds out hope that he might be alive. When his brother Lincoln gets a clue that he might be, he decides to look into it, packing some major cash and more in a duffel bag and heading out. 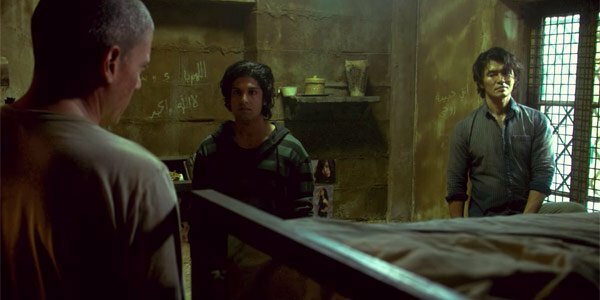 Lo and behold, Michael has simply been in prison this whole time, and it looks like he is planning another daring prison break, with the help of these dudes. Unfortunately, if you’ve been super excited for the Prison Break revival, Fox has kept the series off of its fall schedule to make room for stuff like Lethal Weapon and Star. It looks like we’ll get Prison Break at midseason, similar to what the network did with The X-Files last year. Although we will have to wait until midseason, Prison Break is clearly a priority for the network, and if it does well, this event series may not even be the end of the story. Next fall can’t come quickly enough, but for now you can check out what other TV series are premiering on Fox and the other networks this summer with our premiere schedule.